Geoscience BC has compiled geothermal maps and reports for the Mount Meager area to help unlock the economic potential of this sustainable energy source. Geothermal energy resources can provide baseload power and heat (direct use), bringing potential economic development opportunities, particularly for remote communities. But, characterising geothermal resources and assessing their potential can be a risky and expensive exercise. In addition, much existing data regarding Mount Meager’s geothermal potential was not publicly available. Geoscience BC was given maps and reports from the Mount Meager geothermal area, 160 km north of Vancouver in southwestern British Columbia, and made them available in one place via its website. Anyone interested in the potential for geothermal resource development in the Mount Meager area can use this valuable earth science to make informed decisions. Provides a central repository for existing maps, geology data, reports, and theses about geothermal energy potential in the area. Much of this information was not previously publicly available. Provides the earth science needed to stimulate activity on-the-ground that could lead to the identification and use of geothermal heat (direct use) and energy by businesses, homes, and communities in the area. Earth science data is essential for assessing the economic viability of geothermal energy and heat (direct use) projects. Understanding the characteristics of the rock types and subsurface geological structures that might contain geothermal resources helps communities, experts and governments make informed decisions about pursuing geothermal projects. By including previous studies and findings, fully informed land use and resource development decisions can be made regarding Mount Meager’s geothermal potential. The information may also prove useful to those interested in considering geothermal energy and heat in other areas. 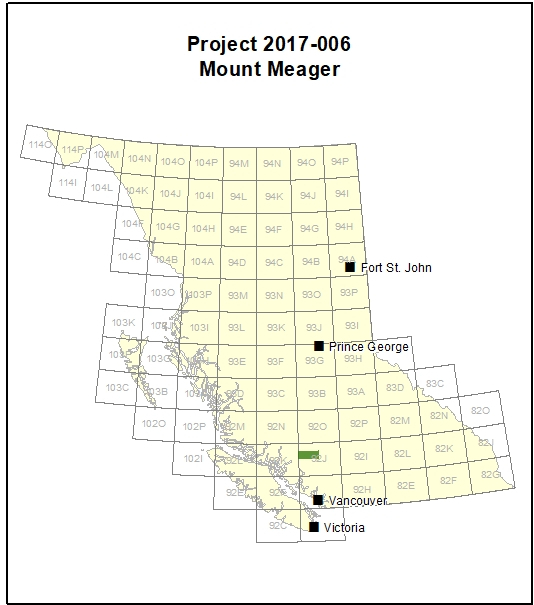 The Mount Meager geothermal area, 160 km north of Vancouver in southwestern British Columbia, has been mapped, studied, and assessed for its geothermal energy potential. Local hot springs have long been used for bathing, but in the early 1970s investigation began for generation of electrical energy from the subsurface hot groundwater. Fractures in the volcanic rocks in the area contain groundwater heated to over 200 degrees Celsius and, since the 1970s, five wells have been drilled to assess commercial viability. Technical work during the 1980s even included the installation and running of a small 250 kw electrical generator. Geoscience BC was given raw data, maps, and reports from companies, government agencies, researchers and students who have worked in the Mount Meager area since the early 1970s. Companies involved in the investigations included Ram Power, Alterra Power Corp. and BC Hydro, all of whom contributed technical documents. Much of this information was no longer publicly available and only some was accessible online. To make the data accessible, Geoscience BC has agreed to make the data available to the public through the Geoscience BC website. There is significant potential for geothermal energy and/or direct use heat generation at Mount Meager. Prior to this project, the previous studies and data were unavailable or difficult to access. Geoscience BC performed the task of compiling the information to make it available to everyone to facilitate more informed decisions. Vigouroux-Caillibot, Nathalie (2011) – Tracking the Evolution of Magmatic Volatiles from the Mantle to the Atmosphere Using Integrative Geochemical and Geophysical Methods. Kimball, Sarah (2010) – Favourability Map of British Columbia Geothermal Resources.